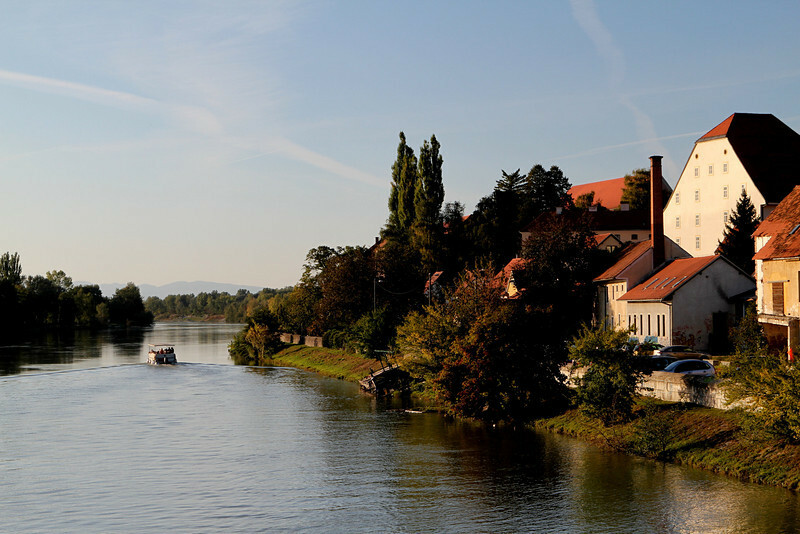 Ptuj, Pop 23,000, the eighth largest city, and one of the oldest towns in Slovenia, whose name in English sounds not unlike someone spitting (puh-TOOey), began life as a Roman military outpost on the south bank of the Drava River. Ptuj later grew into a civilian settlement called Poetovio, mentioned by name in the Historiae by Tacitus as early as 69 A.D. Ptuj received its town rights in 977 and over the next centuries grew rich through trade on the Drava. Two monastic orders - the Dominicans and the Franciscan Minorites- settled here and built important monasteries. Explore a horseshoe-shaped castle complex with engaging exhibits, the Old Town, wonderful restaurants, early morning and evening vistas, and an intimate look at Hotel Mitra near the landmark City Tower and in the heart of compact Ptuj. And explore the back alleys, look at window flower boxes and reflections, navigate river banks and gardens while walking where the Romans walked. The Slovenia tourist marketing tag line this season is I Feel SLOVEnia with LOVE in BOLD. Now you can feel the LOVE in Slovenia too !